India – Korea Comprehensive Economic Partnership Agreement (CEPA) – Korea’s wish list regarding. CBIC amends Notification No. 50/2017-customs dated 30th June, 2017 to postpone the implementation of increased customs duty on specified imports originating in USA from 1st April, 2019 to 2nd May, 2019. Addition of provision related to the Scheme for Rebate of State and Central Taxes and Levies (RoSCTL) notified by the Ministry of Textiles. To give composition scheme for supplier of services with a tax rate of 6% having annual turnover in preceding year upto Rs 50 lakhs. CBIC seeks to supersede notification No. 08/2017 - Central Tax dated 27.06.2017 in order to extend the limit of threshold of aggregate turnover for availing Composition Scheme u/s 10 of the CGST Act, 2017 to Rs. 1.5 crores. CBIC prescribes the due dates for furnishing of FORM GSTR-3B for the months of April, May and June, 2019. CBIC prescribes the due dates for furnishing of FORM GSTR-1 for those taxpayers with aggregate turnover of more than Rs. 1.5 crores for the months of April, May and June, 2019. CBIC prescribes the due dates for furnishing of FORM GSTR-1 for those taxpayers with aggregate turnover upto Rs. 1.5 crores for the months of April, May and June, 2019. CBIC gives exemption from registration for any person engaged in exclusive supply of goods and whose aggregate turnover in the financial year does not exceed Rs 40 lakhs. Discontinuation of printing of Advance Authorisations / EPCG Authorisations on security paper by DGFT for authorisations issued with EDI ports as port of registration. “Morocco Fashion & Tex” in Casablanca under the MAI Scheme from 28th to 31st March 2019. CBIC makes amendments in the earlier issued circulars in wake of amendments in the CGST Act, 2017 (which shall come into force w.e.f. 01.02.2019). Expiry Review by Turkey on imports of “Yarn of Manmade or Synthetic or Artificial Staple Fibres” from People's Republic of China, Indonesia, India, Malaysia, Pakistan, Thailand, Vietnam. CBIC amends Notification No. 152/2009-Customs dated 31.12.2009 so as to provide deeper tariff concessions in respect of specified goods imported from Korea RP under the CEPA w.e.f. 01st January, 2019. CBIC changes GST rates on goods as per recommendations of the GST Council in its 31st meeting. The Executive Summary of Report on "Market for Textiles and Clothing 2017"
SRTEPC Circulars relating to Rationalization of procedures in handling requests under Advance/EPCG Authorizations. CBIC postpones the implementation of increased customs duty on specified imports originating in USA from 17th December, 2018 to 31st January, 2019. New Duty Drawback Rates for 2018-19. Availability of Speed Post dispatch particulars in MEIS Scheme. CBIC extends due date for filing of FORM GSTR-3B for taxpayers in Srikakulam district of Andhra Pradesh and 11 districts of Tamil Nadu. DGFT extends the validity period of EPCG Authorisation from 18 months to 24 months. Amendment to Sea Cargo Manifest and Transhipment Regulations, 2018. CBIC makes amendments (Eleventh Amendment, 2018) to the CGST Rules, 2017. Amendment to Customs Exemption Notifications No. 24/2015-Customs dated 08.04.2015 to align it with amendment in Foreign Trade Policy. CBIC extends the due date for filing of FORM GSTR - 3B for newly migrated taxpayers (obtaining GSTIN vide notification No. 31/2018-Central Tax, dated 06.08.2018) [Amends notf. No. 34/2018 - CT]. 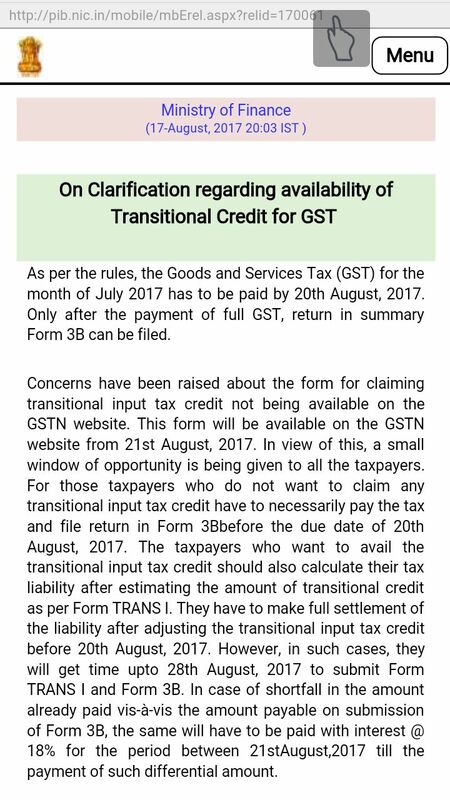 CBIC extends the due date for filing of FORM GSTR - 3B for newly migrated (obtaining GSTIN vide notification No. 31/2018-Central Tax, dated 06.08.2018) taxpayers [Amends notf. No. 21/2017 and 56/2017 - CT]. Seeks to extend the due dates for filing of FORM GSTR - 1 for taxpayers having aggregate turnover above Rs 1.5 crores. CBIC extends the due dates for filing of FORM GSTR - 1 for taxpayers having aggregate turnover up to Rs 1.5 crores. Director General of Foreign Trade (DGFT) as the Authenticating Officer on behalf of the President of India in all Notifications published in the Gazette of India Extraordinary Part-II, Section - 3, Sub-Section (ii). Non-availability of online filing facility of e-com applications, e-IEC, e-BRC on DGFT Website on 31st August, 2018 (Friday) from 3.00 P.M to 7.00 P.M. Regarding shifting of Capital Goods imported under the EPCG Scheme. Amendment in Para 3.24 (j) of Chapter-3 of FTP 2015-2020. Exchange Rates Notification No.74/2018- Customs (N.T.) dated 16.08.2018. Amendment in Para 2.08 of the Handbook of Procedure 2015-2020. Seeks to further amend notification No. 82/2017-customs dated 27th October 2017, to increase Ad-valorem component of BCD from 10% to 20% on 328 tariff lines of carpets, apparels and other textile products. Total Rs.54,378 crore of Refunds processed by the Centre and the States till 31st July, 2018 under GST during the Third Refund Fortnight. Amendment in Para 2.47 and Para 3.05 of Chapter-3 of FTP 2015-2020. Grant of Deemed Export benefits for supplies to the projects funded by Organizations such as JICA etc. under Para 8.2(d) of the Foreign Trade Policy, 2009-14. Accountability of inputs where Advance Authorisations are issued on net to net basis for parts/ components..
Seeks to amend Basic Customs Duty (BCD) rates on certain textile goods. Seeks to impose definitive anti-dumping duty on imports of "High Tenacity Polyester Yarn (HTPY)" from China PR. Seeks to provide the tariff concession to the goods of the description specified in column (3) of the Table hereto annexed and falling under the Chapter. Seeks to amend the Rules of Determination of Origin of Goods under the Asia-Pacific Trade Agreement, (formerly known as the Bangkok Agreement) Rules, 2006. Introduction of new Para 3.24 in the Chapter 3 of the Handbook of Procedures, 2015-20. Inclusion of additional agencies in Appendix 2G of Appendices and Aayat Niryat Forms of Foreign Trade Policy,2015-20. Amendment in the Para 9.03 of the Handbook of Procedures for Chapter 3 Scrips. Amendment in Foreign Trade Policy 2015-20. Submission of application seeking authorization for import/export of restricted items through e-mail. Notification under Section 7 notifying Surat airport as Customs airport. Export Obligation Discharge certificate (EODC) Camp in Regional Authority (RAs) during 11.6.2018 to 22.6.2018. Exports by Post Regulations, 2018. HKDTC Business Matching Application Form - in the context of SRTEPC participation in Hong Kong Fashion Week during July 2018. Seeks to notify NACIN as the authority for conducting the examination for GST Practitioners under rule 83 (3) of the CGST Rules, 2017. Public Notice No.33 dated 23.10.2017 applied to all scrips under Chapter 3 of FTP. Amendments in Appendix 3B of the Foreign Trade Policy 2015-20. Onetime condonation under the EPCG Scheme - Extension till 30.09.2018. Import requirement of a Mexican Buyer for Glass Fibre and Polyester 180 gr. Notification seeks to make amendments (Fourth Amendment) to the CGST Rules, 2017. Roll- out of e-Way Bill system for Intra- State movement of goods in the States of Andhra Pradesh, Gujarat, Kerala, Telangana and Uttar Pradesh from 15th April, 2018. Seeks to impose definitive anti dumping duty on imports of fish net or fishing nets originating from China or Bangladesh. Seeks to rescind notification nos. 7/2018-Customs, 8/2018-Customs, 19/2018-Customs and 20/2018-Customs all dated 2nd February 2018. Seeks to amend notification Nos.11/2018-Customs, 12/2018-Customs, 13/2018-Customs and 21/2018-Customs, all dated 2nd February 2018. Setting up of an IT Grievance Redressal Mechanism to address the grievances of taxpayers due to technical glitches on GST Portal. Re-organization of Export Commissionerate and Formation of Audit Commissionerates (Customs) in Mumbai Customs Zone-I. Seeks to amend various Customs exemption Notifications to exempt integrated tax and goods and services tax compensation cess on import of goods under Advance Authorisation/EPCG Schemes till 01.10.2018. Amendments to Foreign Trade Policy 2015-20 - Extension to Integrated Goods and Service Tax (IGST) and compensation Cess exemption under EOU Scheme till 01.10.2018. Seeks to amend Notification No 52/2003- Customs dated 31.03.2003 for extending exemption from IGST and Compensation Cess to EOUs on imports till 01.10.2018. Amendments to Foreign Trade Policy 2015-2020 - Extension of Integrated and Goods and Service Tax (IGST) and Compensation Cess exemption under Advance Authorisation and EPCG Scheme till 01.10.2018. Processing of Merchandise Exports from India Scheme (MEIS) applications for SEZs Exports. Declaration of Vijayawada Airport as Customs Airport; amendment of Notification No. 61/94(NT)- CUSTOMS dt. 21st November, 1994. Submission of Bank Guarantee for the purpose of extension of Warehousing Bonds as per the conditions of Board’s Circular No 21/2016. Special Drive to liquidate IGST pendency- Holding of IGST Exports Refund Fortnight from 15.03.2018 to 29.03.2018. Amendment in Para 2.17 of the Foreign Trade Policy 2015-20 on "Prohibition on direct or indirect import and export from/to DPRK (Democratic People`s Republic of Korea) in terms of UNSC resolutions concerning DPRK. Amendments in ANF 4F & 4G of Handbook of Procedures 2015-20. Inclusion of Seaports located at Dhamra Port and Dighi Port under Para 4.37 of Hand Book of Procedures 2015-20. Seeks to amend notification No. 82/2017-Customs dated 27.10.2017 to amend the effective rate of customs duty of tariff item 6001 9200. Seeks to amend notification No. 46/2011-Customs dated 01.06.2011 so as to provide deeper tariff concessions in respect of specified goods when imported from ASEAN under the India-ASEAN Free Trade Agreement w.e.f. 01.01.2018. Seeks to amend notification No. 152/2009-Customs dated 31.12.2009 so as to provide deeper tariff concessions in respect of specified goods imported from Korea RP under the India-Korea Comprehensive Economic Partnership Agreement (CEPA) w.e.f. 01.01.2018 . Acceptance of e-BRC of DGFT towards proof of realization of sale proceeds for exports with LEO date up to 31.03.2014 under drawback scheme. Display of sample-products at SRTEPC TRADE CENTRE for establishing contacts with visiting Overseas Buyers. Amendments in Foreign Trade Policy 2015-20. Seminar on Complete Overview On GST & Interactive Session thereon with Questions & Ans. Amendment in Appendix 2G (List of Inspection and Certification Agencies of Handbook of Procedures (Appendices and Aayat Niryat Forms) 2015-20. Issues related to Bond/Letter of Undertaking for exports without payment of integrated tax – Reg. Amendments in the Central Excise Rules, 2002 and CENVAT Credit Rules, 2004. Seeks to appoint the 1st day of July, 2017 as the date on which all the provisions of the Taxation Laws (Amendment) Act, 2017 shall come into force. Regarding the Bill of Entry (Forms) Amendment Regulations, 2017. Clarification regarding amendment in Special Economic Zone Rules, 2006 in Rule 47, after sub-rule (4) dated 05.08.2016. Extension of e-payment deadline and of banking hours. Amendments in Appendix 4J of Hand Book of Procedures 2015-20 relating to Export Obligation Period under Advance Authorizations. 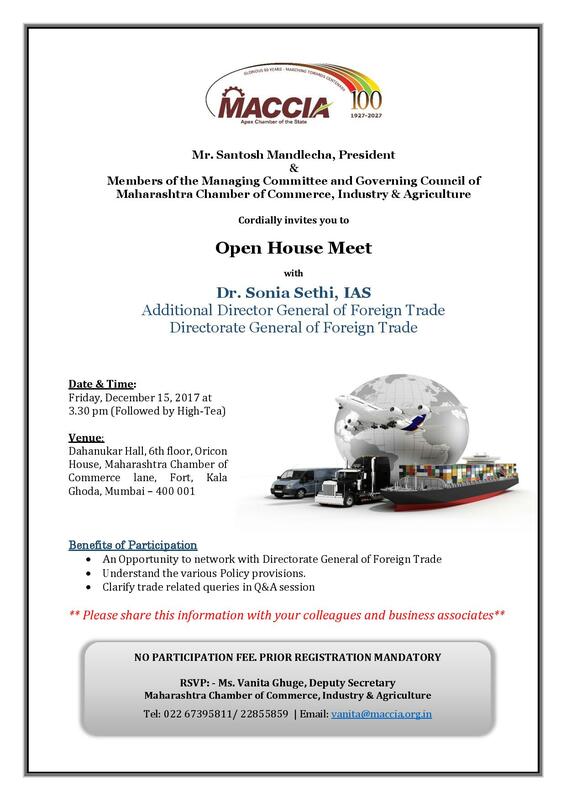 Invitation for participation in The India Sourcing Fair, Colombo (Sri Lanka), 24-26th March 2017. Installation and commissioning of Customs RAPISCAN 620 DV facility for checkpoint screening system at New Custom House. Amendment in Paragraph 3.06 of Handbook of Procedures 2015-20. Addition of new sub para 5.03(c)(i) and (ii) and amendment in sub para 5.10(d)(ii) of Handbook of Procedures 2015-20. Special Discount for participation INTEXPO Ethiopia / INTEXPO Kenya. Standard Operating Procedure (SOP) for allowing Bunkering operation in Mumbai Port. Certification of Origin of Goods for European Union Generalised System of Preferences (EU-GSP) - Modification of the system as of 1 January 2017. Enlistment of one PSIA in terms of para 2.55 (d) of HBP 2015-20 in Appendix 2G. Procedure for claiming Duty Credit Scrips under Chapter 3 of FTP 2009-14 for shipments where LEO date is upto 31.03.2015 but date of export is on or after 01.04.2015. Enlistment of Seven Pre- Shipment Inspection Agencies (PSIAs) in terms of Para 2.55 (d) of HBP 2015-20 in Appendix 2G. Compliance of “Handling of Cargo in Customs Areas Regulations, 2009” by Shipping Lines etc in regard to Electronic Delivery Order, payment options and transparency in charges levied to reduce the dwell time for clearance of imported / export goods. Grievance Redressal Committee Meeting called by DGFT. Regarding non levy of Anti Dumping Duty while filing online Bills of Entry.